Happy Monday! Hope you had a great weekend. 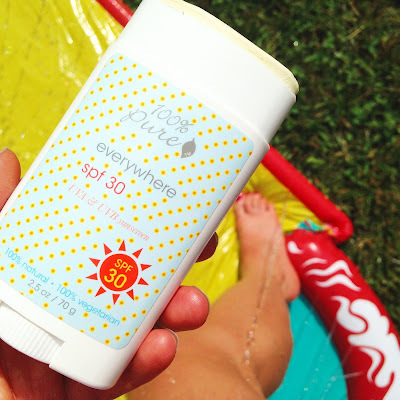 It was hot and humid here, so Hayden and I tested out our new 100 Percent Pure Everywhere SPF 30 UVA & UVB Suncreen, while playing on the Slip 'N Slide in our yard (well, actually Hayden did the sliding; I was cooling off as her lifeguard at the pool end of the slide). 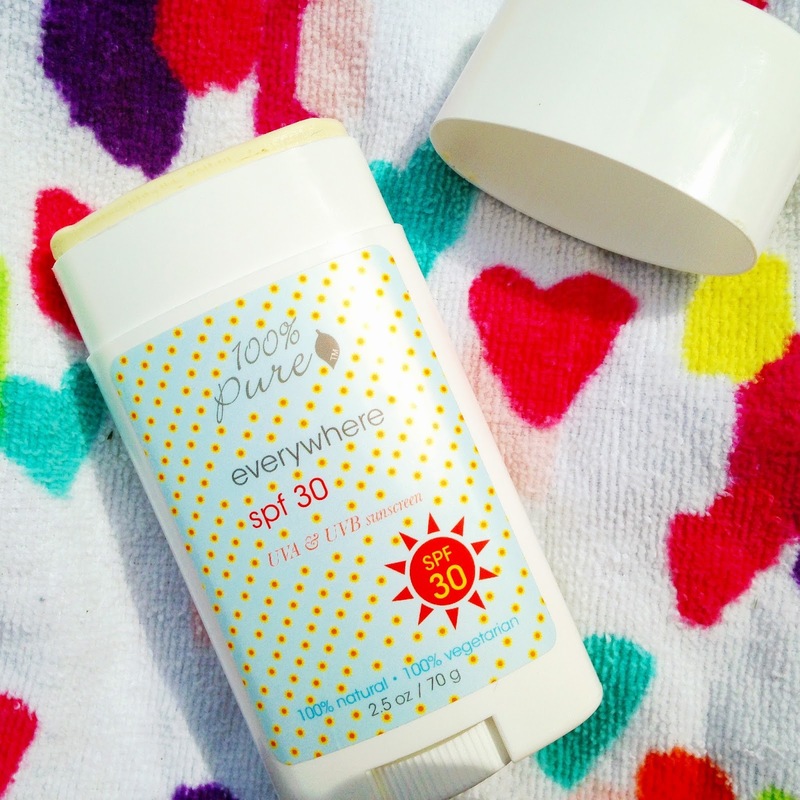 As an official 100 Percent Pure Approved Blogger, I was sent this cute, convenient, solid sunscreen for review. It's packaged in the same type of container as deodorant, which hints at the fact that it doesn't contain that usual potent sunscreen smell (at least I thought it was more pleasant than the typical sunscreens on the market; I think I can faintly smell Calendula). This sunscreen is made from natural, gluten-free ingredients like Organic Helianthus Annuus (Sunflower Oil), Organic Cera Alba (Beeswax), Organic Ricinus Communis (Castor) Seed Oil, Organic Theobroma Cacao (Cocoa) Seed Butter, Organic Persea Gratissima (Avocado) Oil, Aloe Barbadensis (Aloe Vera) Leaf Oil, Tocopherol (Vitamin E), Argania Spinosa (Argan) Kernal Oil and Organic Calendula Officinalis (Calendula) Flower Extract. 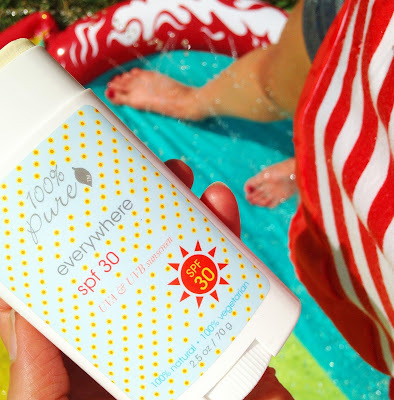 According to the 100 Percent Pure website, "SPF 30 provides a broad spectrum UVA/UVB protection from the sun's harmful rays with titanium dioxide and zinc oxide. Safe and gentle for all skin types, all over body and face, including baby's delicate skin. No fragrance, non-comedogenic. Will not clog pores." After reading the description and the directions on the container, Hayden and I made sure we applied the sunscreen to clean skin, especially since we opted to rub the stick directly onto the surface of our skin. We started with her cute little face. Once our faces were fully protected, we moved on to to the rest of our exposed skin. 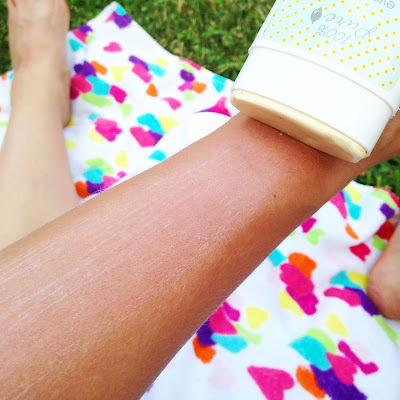 When applied straight from the sunscreen container, you can see a slight film from the active ingredients (zinc oxide is known to give you a white coat), but to my surprise, it blended into our skin nicely. I almost forgot I was wearing it. This solid sunscreen is much easier to apply than expected, although I would love for 100 Percent Pure to make a lotion version. For example, I did rub a little of the product on my hands before applying it to some spots, like the tops on our feet (on another note, I ended up painting my toes with 100 Percent Pure nail polish in Jam, so I guess you can call in toe jam; Ha ha). I'd also prefer a lotion for reapplication (your skin isn't exactly as clean at that point). As for protection, Hayden and I didn't get burnt, although we were only out in the sun for an hour or two. The cool thing was that the sprinkling water beaded up on our skin, which made me wonder if this sunscreen is at least somewhat water resistant. I definitely can say that this sunscreen is moisturizing and would be nice to carry in my purse for on-the-go sun protection. It's 100% natural, vegetarian (it has beeswax) and cruelty free. Have you tried 100 Percent Pure sunscreen? What are your thoughts? Let me know on Twitter at @Rawdorable or on Instagram (also @Rawdorable). 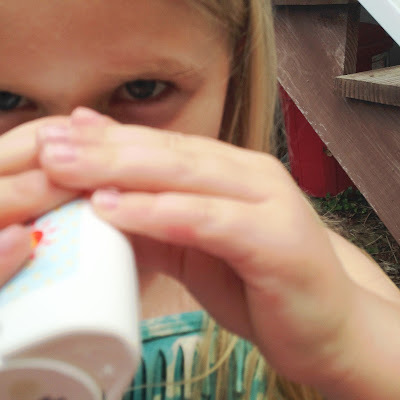 Since it's been so hot (it's been 90-plus and our air conditioning isn't working right), I've been extra excited about Charissa's #ColourfulSmoothie #Challenge (I posted most of my smoothies so far last week). I made a Banana Split Smoothie yesterday that spilled right over the top, but it totally hit the spot. Also, in case you missed it on Instagram, my lipstick of the day is 100 Percent Pure's Fruit Pigmented Lip Glaze in Lychee. It's so moisturizing and pretty. *100 Percent Pure sent me this sunscreen for review. All opinions are my own.